Learn more about social and cultural events, International Education Week, employment and tax workshops, and more. Join us for a variety of events to learn, make friends, and have fun! The information provided in this workshop is intended only to give you a general sense of taxpaying requirements and should not be considered financial or legal advice. Due to legal restrictions, the staff of the Office of International Student & Scholar Services is not able to advise on tax issues, answer individual tax questions, or prepare tax forms for individual students or scholars. However, in March of each year the office provides tax information and a variety of resources to assist international students and scholars with filing their tax returns. For complex situations, it is advisable to consult a tax attorney, a Certified Public Accountant (CPA), or other reputable tax adviser who is familiar with non-resident taxation. OISSS offers monthly employment workshops to provide students with up to date information on seeking employment authorization for on campus jobs, internships, and post-graduation employment. Find out everything you need to know about Curricular Practical Training (CPT) and Optional Practical Training (OPT) work authorization, including application procedures, deadlines, and important information regarding employment and F-1 status, by attending a mandatory workshop. Curricular Practical Training (CPT) is a benefit available to students maintaining F-1 non-immigrant status. This benefit provides students with authorization for employment related to a student's program of study. It is most commonly used for part-time off-campus internships. Optional Practical Training (OPT) is a benefit available to students who have maintained F-1 non-immigrant status. This benefit provides students with 12 months of full-time work authorization related to a student's program of study. Join us as we discuss your options for on-campus employment, internships, and post-graduation employment. What's more fun than food, fun, and proper immigration compliance? Come join the OISSS staff to celebrate the end of the semester and get your travel signatures completed at the same time. If you're planning on travelling during the summer break, you definitely won't want to miss this event! A weekend get-away where a select group of international and study abroad students will join students from colleges across Florida to network and expand their leadership development. International Education Week (IEW) celebrates the benefits of international education and exchange worldwide. A joint initiative of the U.S. Department of State and the U.S. Department of Education, IEW is part of their efforts to promote programs that prepare Americans for a global environment and encourage students from abroad to study, learn, and exchange experiences in the United States. Enjoy cupcakes, pick up your flag pin. Join the Office of International Programs to see which photo will win this year's contest while enjoying light refreshments. Come and enjoy a night of fun playing games from around the world! A group of Rollins international students will participate in Orange County Public Schools "Teach-In" and present their cultures to young members of the Winter Park community. Experience one of South Asia's most important holidays, Diwali- the Festival of Lights, hosted by DESI. Which country will be this year's Rollins World Cup champion? Sign up with friends to represent a country of your choice and compete for the title! 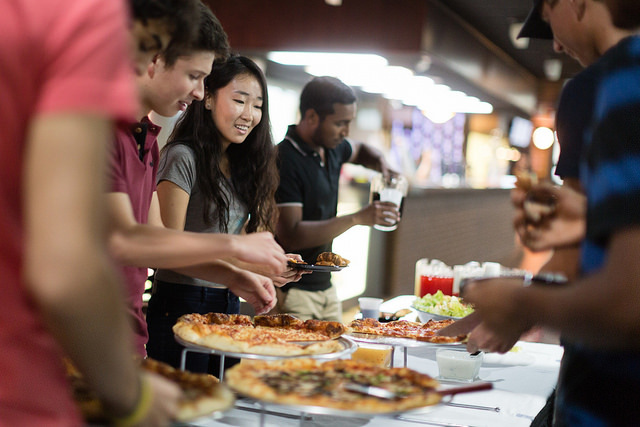 International Education Week in the Community: Sodexo will be celebrating the Flavors of Rollins with dishes from various countries that represent our international students throughout the week. Facilities Management will display the flags representing Rollins' international student population around Mills Lawn throughout the week. OISSS will be offering flag buttons to the community and throughout International Education Week. Currently accepting applications! Submit your application by 5:00pm Friday, February 15. In the fall, we welcome international students with International Student Orientation. 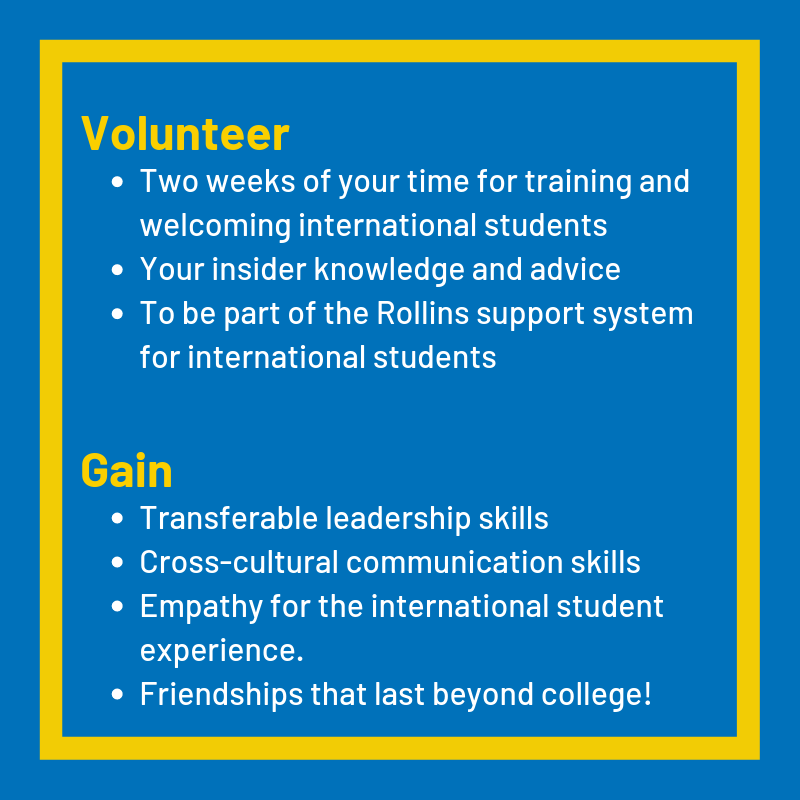 As a Fall Orientation International Peer Advisor (IPA), you will serve as a peer mentor, leading a group of 6-9 students as they begin their transition to Rollins. Join us and start your journey to becoming a global citizen!